This morning I woke up thinking about the current Flash TV show and all the love and respect it directs toward the 90s show and then my mind instantly went to that great DS9 episode Trails and Tribble-ations and I thought, Yes! There's possibility there! The ground work is already set up. Tina McGee was introduced a head of Mercury Labs, Mark Hamill is the first trickster, John Wesley Shipp is Barry's Dad. Hell, even Vito D'Ambrosio is now the Mayor of Central City. 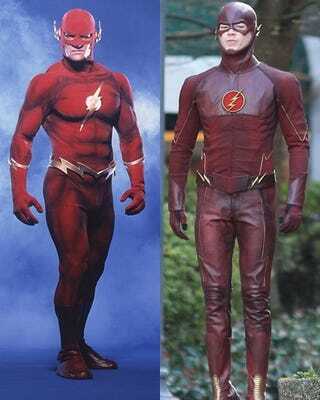 And there's going to be/has already been time travel in the current Flash that has affected Barry's early life. The time stream is already fucked. The potential is there, with minor editing and changes, for a Trails and Tribble-ations-like episode where Barry speeds into an alternate past where his dad, Henry, became the Flash. They never have to call JWS Barry, just Flash or Dad… Awesome, right? I would use the Trickster only because there's a Mark Hamill connection to the current show, but also because you have more footage of him (The Trickster and Trail of the Trickster) to work with. If the tech was there 20 years ago to make that DS9 episode look so good, then it's probably easier and cheaper to do now even on a CW budget. You can even call the whole thing Flash of Two Worlds for good measure and reinforce the idea that Barry was chosen by something and in this parallel universe that same something chose his dad. If anyone knows anyone working on this show please pass along my idea.